Manneken Pis has been a public fountain, a mascot and the hero of many incredible tales. He has received gifts from lords and kings and has been abducted and saved several times. Rich in history and tradition, the origins of the little statue are shrouded in mystery. Luckily, there are many incredible tales that make up for the lack of an explanation. 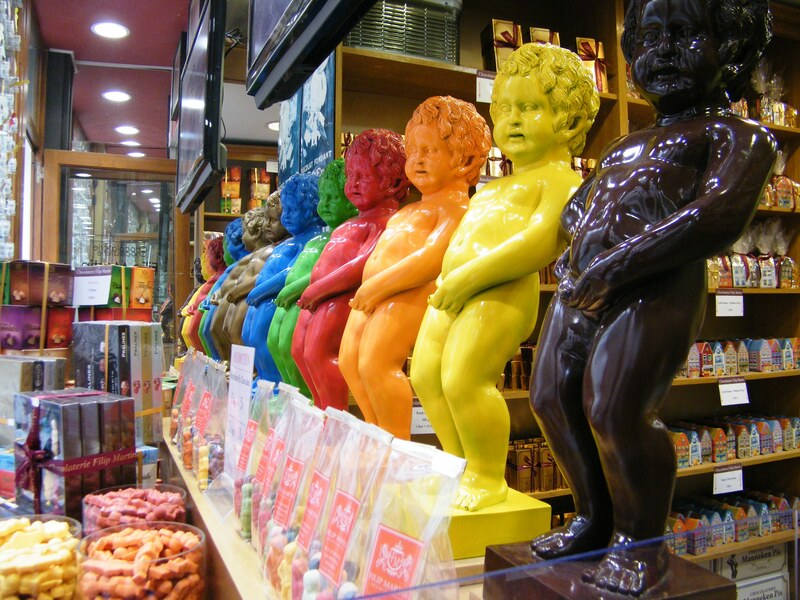 It’s easy to overlook Manneken Pis between the tourist shops and waffle stands. That is if you can spot it at all from behind the many cameras and funny poses. Found at the corner between the Rue de l’Étuv and the Rue du Chêne, there are no clear explanations about why the statue stands there. 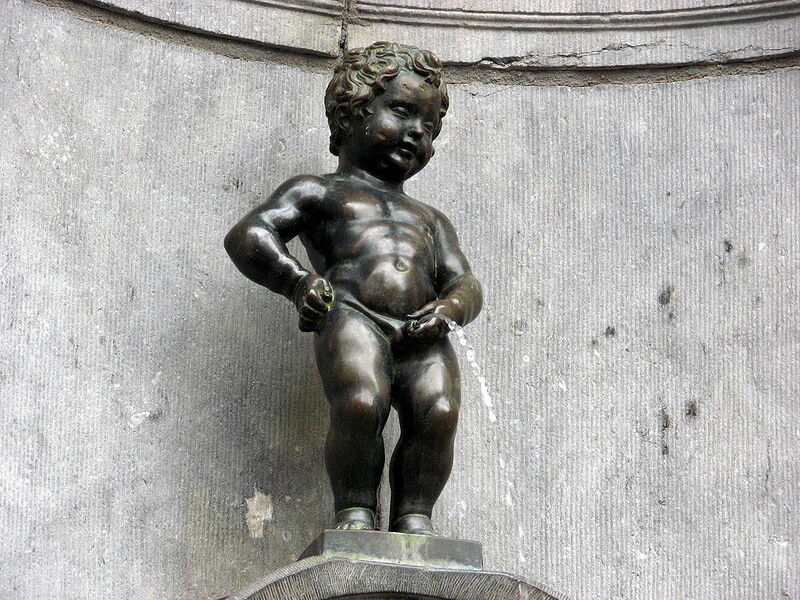 Since little is known about Manneken Pis, here’s a brief history. His name, quite literally, means “peeing little man,” or “peeing boy.” Before this became his title, he was also known as Petit Julien, or little Julien. There are many fables that surround his origins. Some are believable, while others are downright fantastic. The most probable explanation is the many tanners on the Rue de l’Étuv during the Middle Ages. It was not uncommon to let children urinate on leather since the ammonia in urine helps to make the leather more supple. Of course, there is no way of knowing whether Manneken Pis was truly an homage to the tanners. A popular story states how the boy saved the city of Brussels. In this particular story, Brussels was surrounded by enemies who pretended to retreat, but in reality, they were hiding gunpowder under the city. A little boy named Julien saw the burning fuse and quickly peed on it. Out of gratitude, the city made a statue to his likeness. Another well-known story says that an angry witch cursed the statue. The witch caught a boy peeing on her front door. Furious, she cursed him so he would pee for eternity. Luckily, a man who had seen everything quickly replaced the boy with a statue. In another version, the witch succeeded, not only cursing the lad with a forever full bladder but also turning him into stone. 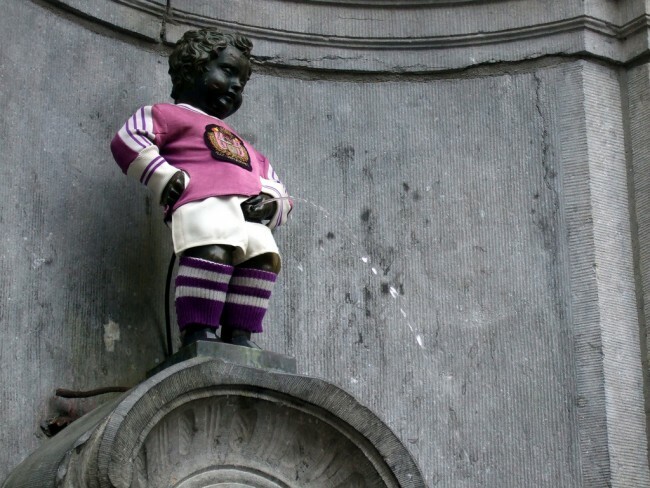 A more believable tale details Manneken Pis as a boy who went missing during festivities in the city. His panicked parents searched for days until they found him peeing on the street corner. Sometimes the father in this story is a wealthy merchant who then decided to put the statue on the very corner he found his beloved son. There are two stories in which Manneken Pis is actually the young Duke Godfrey III of Leuven. In the first one, he ran away from his father’s castle so he could play with other children in Brussels and was finally found on the famous street corner. The more fantastic of the two legends says, however, that the young Duke was tied to an oak tree during battle. When Godfrey was two years old, his father died and two noblemen from the house of Berthout declared war. Godfrey’s guardians asked the Count of Flanders for help. The Count agreed, but his troops were unsure, demanding to see who exactly they were fighting for. To satisfy his army, the infant was shown and taken to battle. There, Godfrey was placed in a basket that hung from an oak tree as a symbol of encouragement for the troops. And encourage them he did — every now and then the little Godfrey stood up and peed on the heads of the Berthout enemies. Godfrey’s allies won the battle and celebrated in Brussels, where they planted the oak tree. Legend states that this is why the street next to Manneken Pis is named Rue du Chêne, meaning ‘oak street.’ And, of course, next to the oak, they erected a statue of the young peeing lord. 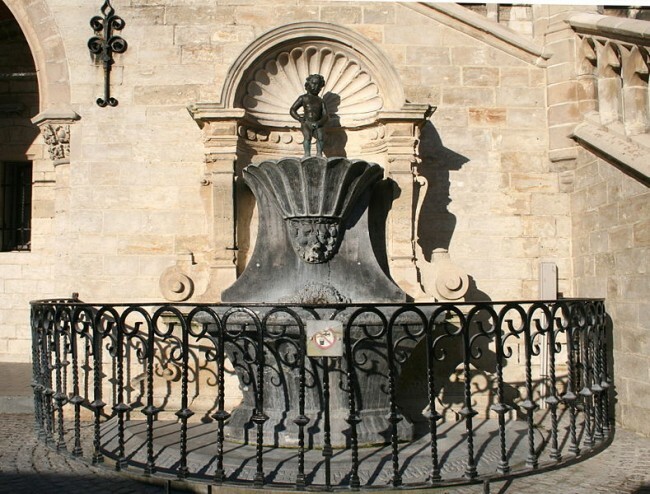 The name Manneken Pis was first mentioned in the archives dating back to 1452. But before that, he was named Petit Julien and was a part of a public fountain on the same street corner. This stone statue was replaced by a bronze sculpture made by Hiëronymus Duquesnoy the Elder in 1619. It is unknown whether the replica resembles the first one, as the original had not been preserved. The statue by Hiëronymus Duquesnoy was destroyed in 1817 and was stolen by a freed slave named Lycas. Fortunately, the pieces were found and glued together to make a mold for a replica. The current statue was made in 1965, after Manneken Pis had disappeared again. After several months, the broken statue was found in the Brussels canal and currently resides in the Maison du Roi at the Grand Place. Manneken Pis has been stolen and retrieved several times throughout history. In 1745, it was stolen by English soldiers but was found in the city of Geraardsbergen. To thank the helpful people of Geraardsbergen, a replica was gifted to the city, though Geraardsbergen already had a Manneken Pis since 1459. To date, there’s a rivalry between the two cities, who each claim to own the oldest statue. It was stolen again in 1747 by French Grenardiers who were in Brussels as a part of Louis XV of France’s army. The population of Brussels revolted, almost causing a riot. To make up for the behavior of his soldiers, Louis XV gave Manneken Pis beautiful clothes in brocade, embroidered with gold. The last time it was stolen was on a cold winter’s night in 1963, by the Antwerp Student’s Union de Wikings. It was stolen as a joke but also as a means to raise money for a good cause. Since it was done for a good cause, the students were not punished. It’s a tradition to dress the little bronze statue at special occasions. His wardrobe, which contains more than 800 costumes including the expensive outfit gifted by Louis XV of France, is kept at the Maison du Roi. The first clothes Manneken Pis ever received were given by Maximilian II Emanuel, Elector of Bavaria, the governor of the Austrian Netherlands. Besides historical clothing, the wardrobe also contains modern costumes, such as a Mickey Mouse and Santa Claus costume. Manneke Pis is not the only peeing statue in Brussels. In 1987, he was joined by a peeing girl named Jeanneke Pis. Her statue can be found on a dead end street, near the Rue des Bouchers. The family expanded in 1998 with Zinneke Pis, a peeing dog. This statue was placed on the sidewalk of the Rue de Chartreux. If finding all three, it’s sure to become a series of funny pictures. 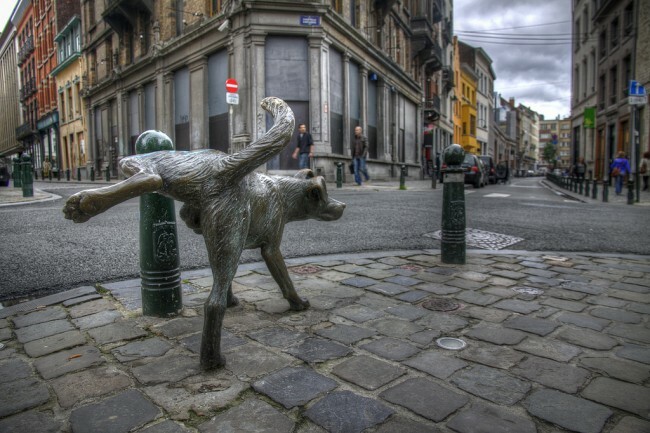 After all, out of all the statues and symbols Brussels could have chosen as a mascot, its sense of humor picked a little peeing boy, with many legends to its name.